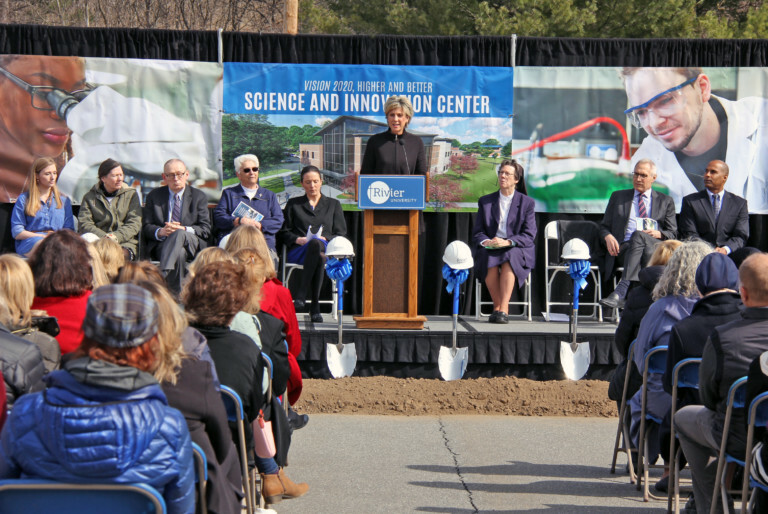 Dianne Mercier, chair of the Rivier University board of trustees, addresses the audience at the official groundbreaking ceremony for the school’s new Science and Innovation Center. Rivier University has broken ground for a 35,000-square-foot Science and Innovation Center, designed to boost the university’s life sciences offerings. Hutter Construction of New Ipswich is the general contractor and Pennsylvania-based Derck and Edson is the architect. Construction of the facility follows projects already in progress — a new athletics pavilion and updates to Raider Diamond. Completion of the Athletics Pavilion is slated for fall 2019, and the Science and Innovation Center is expected to open in fall 2020.